Tom Rowland is a jack of all trades. He learned fishing from his father and grew into his love for the sport during his time working at Yellowstone National Park. He started a guiding career in Jackson Hole, WY and spent seven seasons out on the water before needing a change and making the inevitable shift to saltwater guiding. 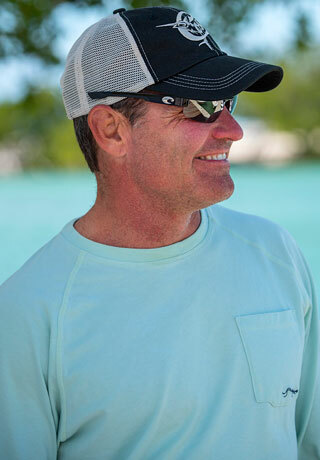 He relocated to Key West and spent a full year scoping out the waters and learning the fishing tricks before bringing clients along for the ride. His reputation as a talented, capable, and patient guide spread quickly and had him booked for most of the year. But he’s also a talented fly fisherman, quickly racking up competition titles for casting. Like we said, jack of all trades — if it involves fishing, you’re sure to find Rowland nearby. What is the weather doing? When am I going to get my workout in? There is not one thing that I could do better. I could do all things better. Life is about constantly learning and improving. Not really…I love all things about fishing and guiding. The good and the bad, the easy and the difficult, the bountiful and the skunked. The bad days make the good ones that much sweeter. I love the sound of water. The ocean, a river, a waterfall…any water. I would be a trainer or aging professional athlete trying to figure out how to fish for a living. Wow, tough one. There are so many people to choose from but honestly, I would want to be with my children more than anyone else.